Barilla's delicious tomato sauces are the ideal complement to any of our pastas. Our Traditional sauce is gluten free and contains no preservatives so you can feel good serving it to your friends and family. We start with the highest quality ingredients like vine-ripened tomatoes, aromatic herbs, and extra virgin olive oil and simmer these together to develop a hearty and delectable sauce. Real taste comes from real ingredients! Traditional sauce is made with non-GMO ingredients. For more information, please read our position. Barilla Traditional sauce is a true family sauce. Simple, yet full of delicious flavor, Traditional sauce is versatile and easily complements any of our delicious pasta shapes, like Barilla Spaghetti or Rotini. 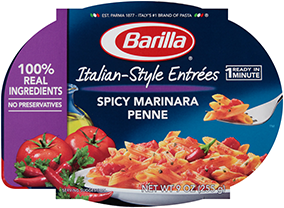 Barilla Traditional Sauce is delicious tossed with just about any Barilla pasta. Try this classic sauce with the Barilla Spaghetti family or our Jumbo Shells or Lasagne for an easy-to-prepare, authentic Italian pasta meal.